Andy Martinez (holding plaque, left) recently received a resolution from the Missouri House of Representatives recognizing his award-winning performance at the 2017 Special Olympics World Winter Games in Austria. Missouri State Representative Kevin Corlew (holding plaque, right) made the presentation. Martinez’ coworkers at Vocational Services, Inc., in Liberty gathered for the presentation. Kansas City resident Andy Martinez received a hand-delivered resolution from the Missouri House of Representatives on Friday, May 19. While working at Vocational Services, Inc., in Liberty, Martinez was surprised by a visit from Missouri State Representative Kevin Corlew (R-14). 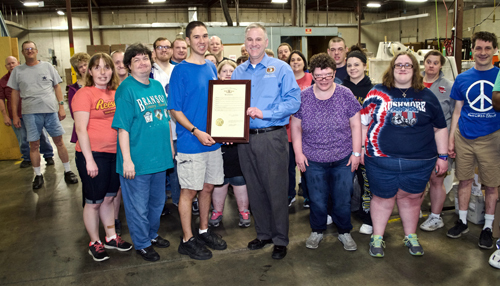 In front of friends, families and co-workers, Corlew presented Martinez with a Resolution from the Missouri House of Representatives recognizing Andy's award-wining trip to this year's Winter Special Olympics in Austria. On hand for the event at VSI's Workshop Annex were Andy's parents, aunt, uncle and other family members, along with his co-workers, VSI staff and friends. Martinez, 32, earned a bronze medal in a snowshoe competition and several awards in other events during the 2017 Special Olympics World Winter Games in Austria, March 14-25. Staff members at VSI first gave Martinez his nickname, “The Snowman,” for his ability to run in conditions that make it hard for others to even walk. Martinez has been employed at Vocational Services, Inc., in Liberty for 10 years and is well known for his athletic talents. He previously competed in the 2009 World Special Olympics in Idaho.